Gas station parking lots are one of the most used areas in the realm of commercial property. 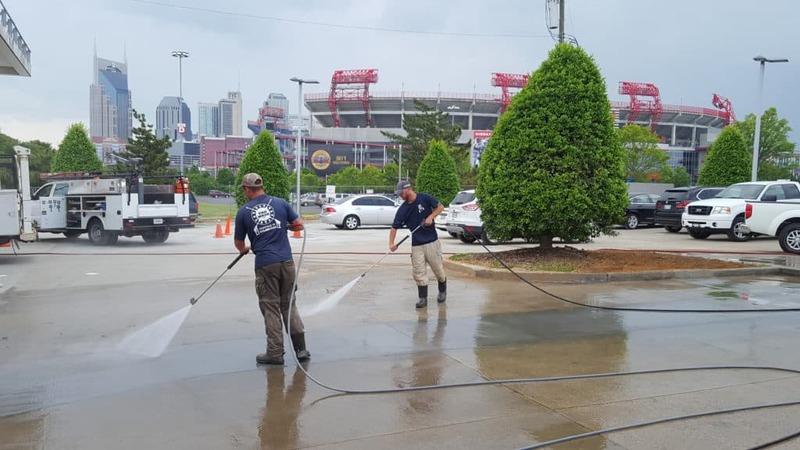 Pressure washing gas stations in Nashville removes the automotive fluids, chewing gum and other debris that commonly finds itself on high traffic concrete surfaces. Some of the surfaces that are routinely pressure washed at gas station include parking areas, canopies, sidewalks, dumpster areas and sometimes the buildings themselves. The overall feel of a fuel station that has routine cleanings is far more inviting than the alternative. All customers will see the concrete parking lots and sidewalks as they enter the facility. There are many facets to completing a pressure washing project at a gas station. Fuel pumps must be protected from water, areas of the parking lot must be blocked off, and boundaries must be set to protect people and vehicles. The contaminants found in the concrete at any fuel station are some of the most complex to remove. Motor oil and diesel fuel stain removal require strong detergents combined with high pressure hot water. These contaminants and the detergents used can not be allowed to enter storm water drains. Pro Wash, LLC uses special gas powered vacuum reclaim systems to vacuum the contaminated wash water and discharge it into the proper area to stay in compliance with storm water regulations. Pressure washing gas stations is often done during night time hours, when the flow of people slows down. This presents even more challenges such as lighting. Many times, we have to supply lighting in order to properly power wash the areas in need. One of the biggest priorities is getting in and out fast. When fuel pumps are blocked off, the establishment is loosing money. A good practice is to only close one pump at a time and as soon as one area is finished, re open the pump. This keeps the majority of the fuel pumps open and ready for customer use. Signage, cones and barriers are also helpful to establish boundaries that the facilities customers should not cross. This keeps them out of harms way and allows the entire process to move more efficiently with less down time. Here is a great checklist that includes preferred service intervals for not only pressure washing but many aspects of gas station maintenance. Fuel station maintenance checklist. At Pro Wash, LLC we have become experts at pressure washing gas stations in Nashville. Over the years we have developed tried and true methods that allow us to get in and out quickly so that minimal interruptions to the business occur. 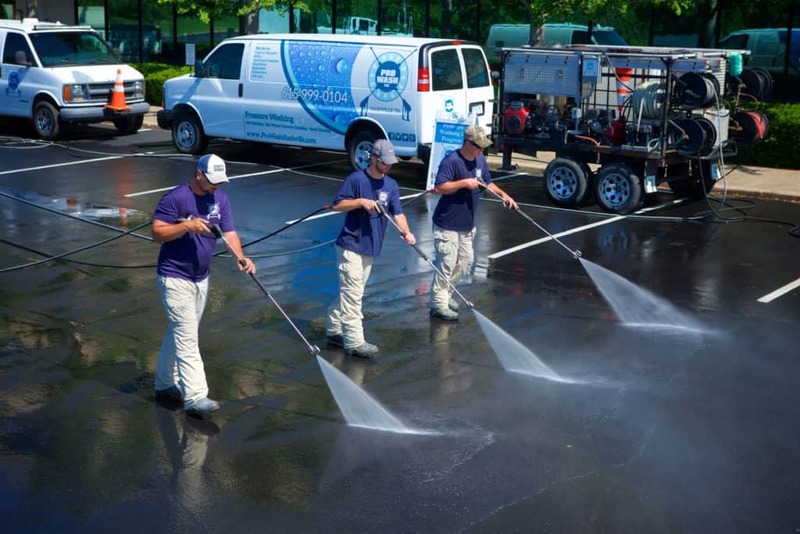 The use of large area surface cleaners allows us to clean large areas of concrete quickly and provide a uniform and even cleaning pattern. In addition, our equipment and processes will ensure squeaky clean results while keeping the facility in compliance with local, state, and federal wash water disposal laws. As always, we would be happy to perform an onsite demonstration of our services at your location. We have many references available for this service and have completed major pressure washing projects for companies such as Exxon, Sunoco, BP, Shell, Marathon and many smaller locally owned stores. We would also be happy to offer a free consultation regarding cleaning processes and frequencies. Visit us at www.ProWashNashville.com or call us at 615-999-0104 for more information.